A majestic palace, The Laxmi Niwas Palace has now been converted into a heritage hotel fully fledged with modern comforts. Accommodation facilities provided at Laxmi Niwas Palace are marvelous. The hotel offers 42 well furnished and elegantly appointed palatial rooms to its guests. Categorized as Suite and Deluxe rooms, the rooms in Laxmi Niwas are air conditioned and well equipped with modern amenities. Providing home cooked like delicious food to its guests, The Laxmi Niwas Palace promises its guests with a fine and a memorable dining experience. 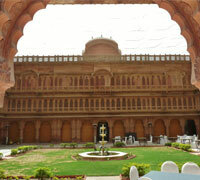 Hotel Harasar Haveli is one of the of the finest heritage Bikaner hotels. There is total of 38 rooms in the hotel and all the rooms ooze of the Rajasthani style of architecture and traditional Rajasthani aura. Tourists who stay in any of these rooms never find themselves short of any amenities or requirements as all the necessary and basic ones are provided in these rooms. 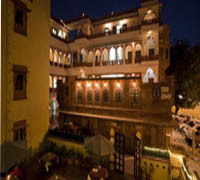 With the open air restaurant in this heritage hotel of India, the dining is a pure delight. Tourists are served here amazing Rajasthani delicacies cooked according to authentic Rajasthani flavors. Tourists enjoy dining and wining in here while under the starry sky at nights with traditional dance and music performances for entertainment.